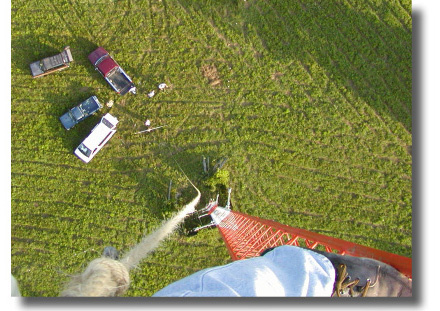 Project Leader, Bill Call “KJ4W” looking down from 210 feet at the ground support crew during the summer, 2002 tower dismantling event. Project Leader, Bill Call “KJ4W” and members of his team pouring concrete for the tower. 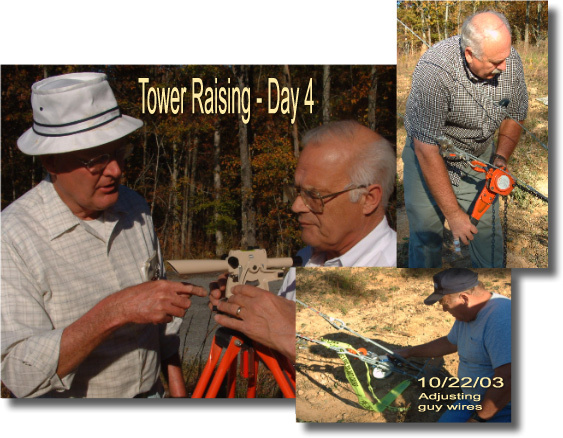 Bill Call “KJ4W” and others at work erecting the soon to be 180 ft. tower. In the center lower photo note the ingenious way that each guy wire is attached to it’s anchor point without the usual cable clamps. “Up she goes” Bill Call “KJ4W” at about 118 feet carefully attaching a section of tower with the aid of the “Gin Pole” and his ground crew. Bill reported that he had a great view of the lake from his vantage point. 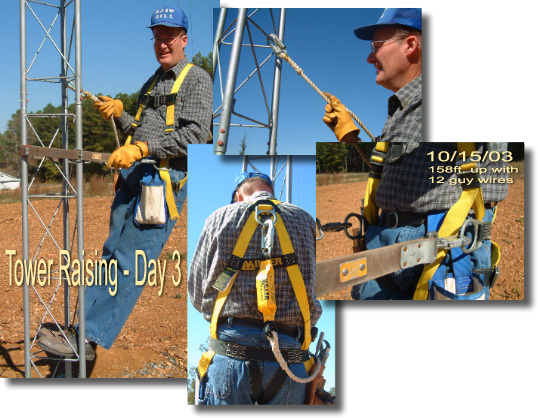 Bill Call “KJ4W” demonstrates his new fully OSHA approved climbing belt with rope lanyard. 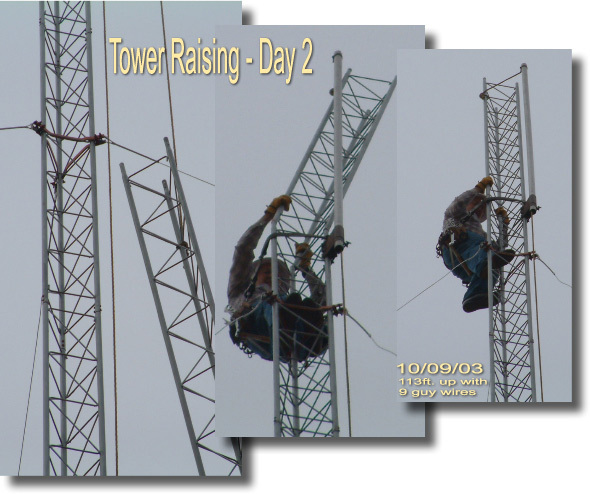 This photo montage was taken just after Bill returned to terra firma from atop the nearly completed tower. 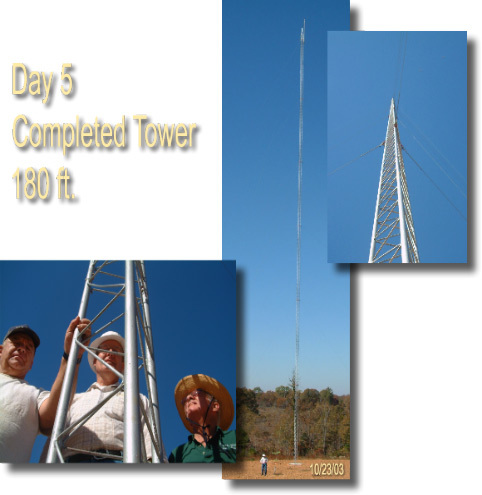 One more work day and the tower will reach to it’s planned 180 ft. height. 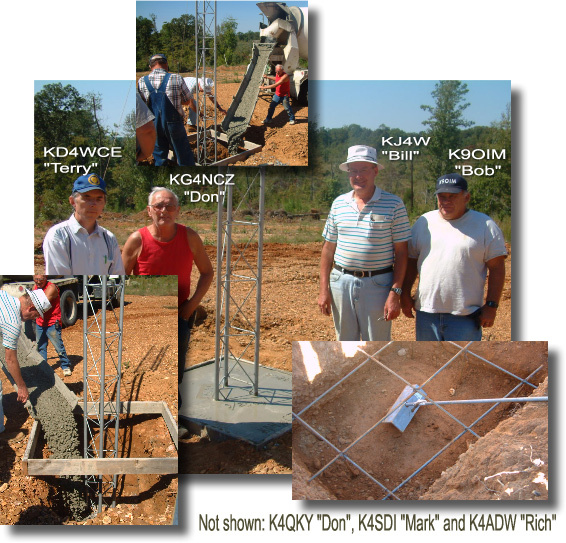 Bob “K9OIM”,Bill “KJ4W” and Don “KG4NCZ” pose for a photograph following completion of the tower. Don “K4QKY”, Don “KG4NCZ” and Bob “K9OIM” giving Bill “KJ4W” a thumbs up after attaching the final guy wire to the ground anchoring point. Bill took all three photos from the top of the tower. 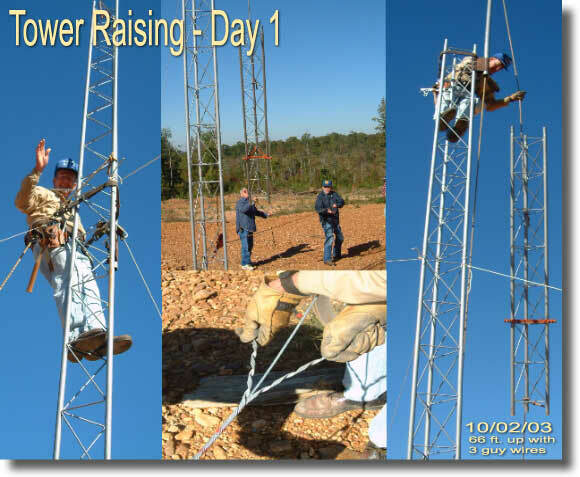 Bill “KJ4W” installs Diamond Model X-500HNA Dual Band VHF/UHF vertical antenna atop the tower. Ground crew, consisting of Don “KG4NCZ” , Bob “K9OIM” and Terry “KD4WCE”, hoist 7/8 inch hard line up to the top of the tower. 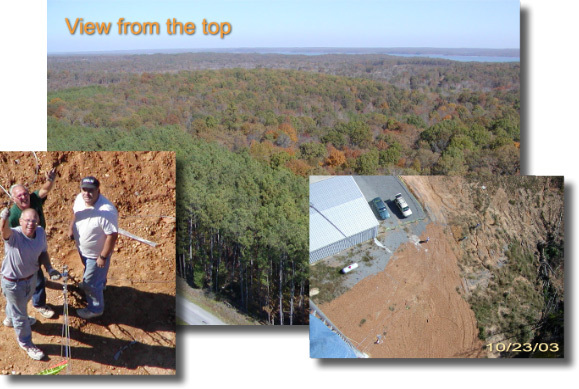 (see unique gripper in center photo used to attach hoisting rope to end of hard line). 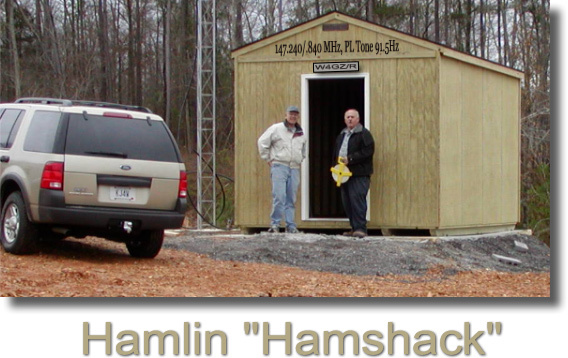 Don “k4QKY” and Doyan “KA4BLZ” admire the new shack moved to the tower site in late December, 2003. The 147.240/.840 MHz, PL Tone 91.5Hz repeater was subsequently moved into the shack with power and antenna hookups completed in early January, 2004. 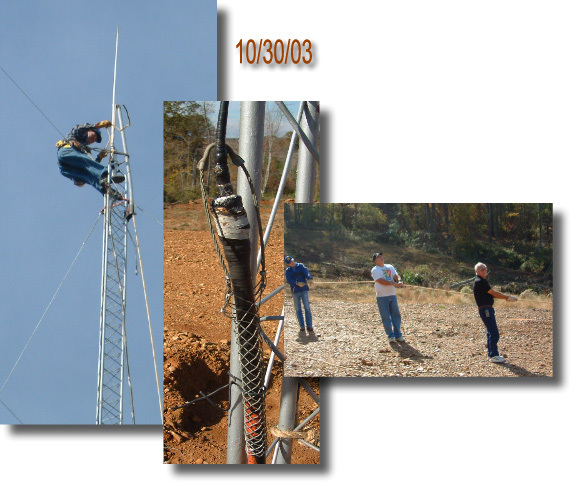 The repeater became operational January 5, 2004.